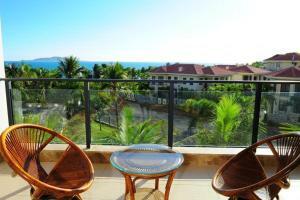 18 Degrees Blue Holiday House is perfectly located for both business and leisure guests in Sanya. Both business travelers and tourists can enjoy the hotel's facilities and services. Service-minded staff will welcome and guide you at the 18 Degrees Blue Holiday House. Some of the well-appointed guestrooms feature whirlpool bathtub, air conditioning, desk, balcony/terrace, internet access – LAN (complimentary). Take a break from a long day and make use of outdoor pool. Convenience and comfort makes 18 Degrees Blue Holiday House the perfect choice for your stay in Sanya.